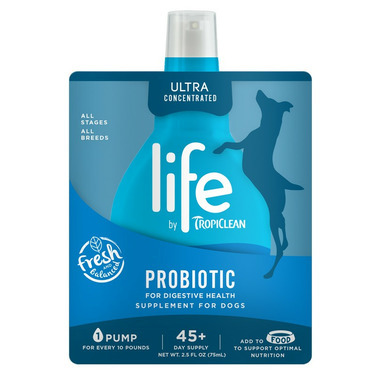 Life Probiotic Supplement for Dogs supports your pup’s digestive health with probiotics, prebiotic fibers, and coconut oil for digestion and immunity. This blend of fresh oils includes natural antioxidants from sustainably caught Norwegian salmon and Alaskan pollock from the Bering Sea. Packed with vitamins A, D3, and E, and combined with a 3-seed blend of sunflower, flaxseed, and canola oils, Life works from the inside out to support digestive health and overall wellbeing. Directions: Just add one pump to your dog’s food for every 10 pounds he weighs. Ingredients: Canola oil, pollock oil, coconut oil, salmon oil, mixed tocopherols (preservative), rosemary extract, natural vanilla flavor, flaxseed oil, fructooligosaccharide, hemicellulose extract, yeast extract, dried enterococcus faecium fermentation product, dried lactobacillus casei fermentation product, dried lactobacillus acidophilus fermentation product.